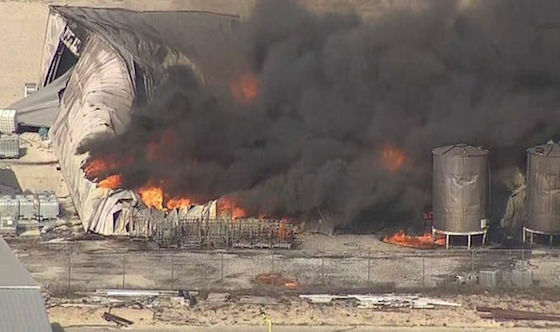 Tri-Chem Industries plant in Cresson, TX, after an explosion jolted the facility. Officials found the remains of a body believed to be the worker missing in the blast. After an explosion and fire at a chemical plant in Cresson, TX, March 15, officials searched for a missing worker and finally recovered remains last Wednesday. The remains were taken to the Tarrant County Medical Examiner’s Office in Fort Worth for positive identification. Officials believe the remains are those of Dylan Mitchell, 27, the one worker who remained missing since the fire and explosion at Tri-Chem Industries. At least 12 workers were in the building when the fire erupted and 11 of those workers have been accounted for. Members of the Hood County Fire Marshall’s Office and the Tarrant County Arson Task Force continue to investigate the cause of the fire and explosion that occurred on Thursday at the Tri-Chem Industries plant. Workers also continue to clean residue from the chemicals that seeped onto the ground from the explosion and the fire that followed, said Earl Gillum Jr., a Texas Department of Public Safety spokesman. Officials have said EPA workers have made repeated visits to the plant site to make sure the air quality remains good.